Who has tasted World Cup success in 7s and XVs? Features: Who has faced two different Lions tours? Features: Why isn't there a UK rugby team? In this edition, John answers queries about stars of both forms of the game, free-scoring back lines, Championship draws, Hugo Porta against the Lions and Gael Fickou. England and New Zealand are the only nations that have won both the Sevens and Fifteens Rugby World Cups. England won in 1993 (Sevens) and 2003 (Fifteens) and New Zealand did so in 2001 (Sevens) and 1987 and 2011 (Fifteens). Lawrence Dallaglio is the only player who has featured in World Cup winning finals in both versions of the game. 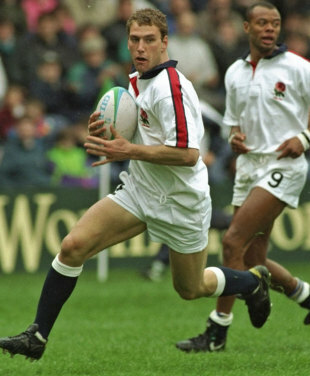 He was a young uncapped member of the England side who beat Australia 21-17 to win the inaugural Sevens title at Murrayfield in 1993 and was a key member of the England back-row who beat the same opponents (20-17 after extra time) in the 2003 Final. Two others have been part of Sevens/Fifteens RWC-winning squads. Matt Dawson was the reserve scrum-half (to Dave Scully) in England's 1993 Sevens squad and started the 2003 Final. Mils Muliaina played for the New Zealand seven who lifted the World Cup in Argentina in 2001, scoring one of the tries in the 31-12 victory over Australia in the Final in Mar del Plata. He was also a member of the squad that won the 2011 World Cup, but did not feature in their winning final against France. Tries by fullbacks in Test rugby were very rare before the introduction in 1968 of the Australian Dispensation Law, which restricted direct kicking to touch. Since then, each of the Tri-Nations and Five Nations (except Ireland) has managed the feat of getting their starting back-five across the whitewash at least once in cap matches. The most recent instance was in 2011 when Australia's back-five (Kurtley Beale, Adam Ashley-Cooper, Anthony Fainga'a, Rob Horne and Drew Mitchell) each crossed for tries in the RWC Pool match against the USA in Wellington. Sitiveni Sivivatu, who featured among Clermont's scorers at the weekend, was twice involved in New Zealand Tests where all of the back-five achieved tries. Nick Evans, Joe Rokocoko, Isaia Toeava, Aaron Mauger and Sivivatu each scored against Romania in the 2007 RWC Pool match at Toulouse. Earlier, on his debut in a warm-up Test against Fiji in 2005, Sivivatu played in the New Zealand side that beat Fiji 91-0 in Albany. On that occasion the back-five try-scorers were Mils Muliaina, Doug Howlett, Tana Umaga, Mauger and Sivivatu. Dan Carter also scored a try that day providing an instance when numbers 15 to 10 all scored in the same Test. Draws are relatively rare in modern Test rugby. Since the Six Nations began in 2000 there have been only five (in 210 matches). Ireland and France this year were the first teams to play repeat draws in the tournament and the first to record successive ties in the Championship since the early 1960s. England and France played a record three successive drawn matches between 1959 and 1961. France were outright champions in 1959 but could only manage a 3-all draw (a penalty goal each) at Twickenham in 1960. The two sides shared Championship honours in 1960 when they played another 3-all draw, in Paris, an England try by Mike Weston cancelling out a French penalty goal. France were outright champions again in 1961, but missed the Grand Slam because England held them to a 5-all tie at Twickenham. Vic Harding crossed for England's try, John Willcox converting, and Michel Vannier converted France's try by Michel Crauste. The great Argentinean fly-half was invited to play for the South African Barbarians against Bill Beaumont's Lions tour team in 1980. Porta had been out there as captain of the South American Jaguars earlier in the season and so impressed the Springboks with his tactical nous in the two Tests that he was asked to return to play against the Lions. The match was played on July 2, 1980 in Durban shortly after the Lions had lost the third Test (and with it the series). Derek Quinnell was the captain for the day as the Lions ran out 25-14 winners against a SA Barbarians XV that was led by Australia's Mark Loane and included Johannesburg-born Tito Lupini, who later won 11 caps for Italy as a prop. Porta was partnered at half-back by the excellent Zimbabwean Ian Buchanan, who scored one the hosts' three tries. Porta landed a conversion for the invitation side. Fickou moved to Toulouse from Toulon last summer and made such an impact with his direct play that Philippe Saint-André called him up for the group that prepared for last autumn's Tests against Australia, Argentina and Samoa. He was still only 18 when he came into the match-day squad (as a late replacement for Florian Fritz) for France's last Six Nations match against Scotland last month and won his first cap when Mathieu Bastareaud went off late in the 23-16 victory at Stade de France. France's youngest alltime cap was Claude Dourthe. He was only 18 years and 7 days old when he played against Romania in Bucharest in November 1966.